You know every bingo player has said at least once Love My Bingo! Play where all the passion starts with a community that is warm and friendly. Delivering a bundle of good cheer and bingo across the board in variety you’re bound to fall in love instantly at Love My Bingo. The theme of this online bingo site is just what the bingo doctor ordered full of red fluttering hearts that beam with pride on the homepage. You won’t only be at home while you play you destined to feel right at home too. If bingo makes your heart flutter then Love My Bingo is the online site for you! Hosting an extravaganza of bingo variations is a big plus for players who enjoy a variety. Your certain to hear the pitter patter of your heart thumping wildly with excitement. As part of the Live Bingo Network players are guaranteed reliability and integrity with many successful brands under this umbrella. Love My Bingo is powered by Cozy Games offering top notch products and is highly regarded among the online bingo community. What set’s this site apart from the rest is the many bingo options available to players. You will find it all under one complete virtual roof with 90, 75, 80 and 30 ball Bingo. There are plenty of bingo rooms featuring Mini Games, Chat Games and Jackpots including Progressives, Big Ben, Snowball Jackpots and more. Pre-buy tickets in advance and don’t miss out on special bingo games. Ticket prices vary and are suited well for every type of player whether you’re a high roller or low roller. The lobby opens up to a wide variety of gaming for those looking for other options with a brilliant library of Slots, Casino Games and Scratch Cards. Players have the option to play in Cash or BB’s mode. Free Bing Bucks and No Deposit Bonuses are the special perks worth joining up for. Straight away new players are invited to take advantage of a Free Bonus offer and test drive the games without risking your bankroll. Bonuses on your first three deposits are available and offer high percentages’ therefore the greater the transaction the larger the bonus awarded. Free Bingo rooms are open daily and what is more amazing is there is Progressive Jackpots up for grabs. Chat Mods host Chat Games and award Bingo Bucks to the winners. Cash-back, Deposit Bonus specials and exclusive promotions offer enormous incentives. The Loyalty program has four levels including Silver, Gold, VIP and SVIP. As players progress through each level the Bonuses increase. Earn Loyalty Points playing Bingo and Slots and move up in status. One of the major benefits of playing at Love My Bingo is the benevolent Bingo Bucks that are often awarded to players. This gives players leverage to play not only with cash but bingo bucks which can be converted to real money. We rate Love My Bingo with four Pink Hearts. They really offer a ton of different bingo varieties here, including 30, 75, 80, and 90 ball. I really enjoy the sites that offer speed bingo and I feel like not a whole lot do. It’s a fun game and it’s nice to have when you’re a bit burnt out on the usual favorites. They also allow you to pre-buy your bingo cards, which is definitely a plus! There is also a pretty interesting selection of slots with a lot of the popular games everyone loves. You can also get a glimpse of all their newest and latest games that they add to the site on a frequent basis at the bottom of the games page. You won’t miss out on the action of the casino because they’ve got plenty of table games to keep you busy, from blackjack to roulette and more. Free bingo is a must and they offer it every day in the red bus room for four full hours! Love My Bingo is a name catchy enough that i decided to join this site after i saw it listed here at Bingo Reviewer. It is definitely a four heart site in my opinion. I played the free £15 trial and i knew because it was a trial i couldn't cash out any winnings but it was a good way to get my feet wet at this site. What's cool about Love My Bingo is that they offer all variations of bingo 90/80/75/30 ball so i have lots of options when i looking for a change. Make sure to read the Bingo Blogs with the latest offers and find goodies like No deposit bonus coupons. I found this to be a great site. I originally signed up because I had heard they were pretty good and I was not disappointed. They have lots of varieties when it comes to bingo. I was very happy upon discovering this because you constantly see just 75 and 90 ball everywhere. I appreciated them bringing something new to the table. If nothing else, I would continue coming back to this site based on their bingo varieties alone. They also give away a pretty nice welcome bonus at this site. For signing up you will get £15 credited to your account for free as a generous free trial offer. I can’t complain about the free bingo either! They have some really great offers, including a totally free bingo room! Another great thing about them is that they have a mobile version of the site as well, so you can keep playing even when you’re on the go. This turned out to be one hell of a site for me, although I didn't expect that much from the very start. It looks a bit generic and not all that impressive if you ask me, but it is really not easy to be original, there are just too many sites around. The only thing I wanted to know is what bingo can I get there, and good news for everyone, you will get it all: classic 75 and 90 ball bingo, 80 ball bingo and my personal favorite 30 ball bingo. Total of eight rooms, which is really nice, and even better, one of them is free. 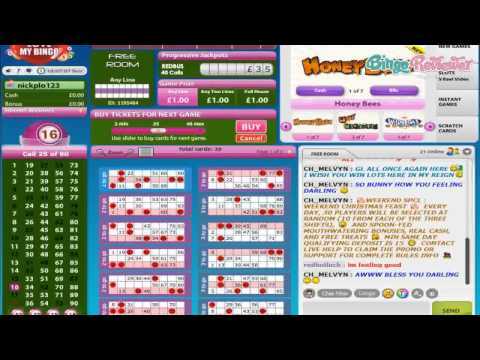 What is also very nice, is the fact that apart from Bingo, you can play Slots, which I also love, and this is the site I will stay on for some time. Not only that, but I also won a few times, and got the money really fast.